Personalized slider puzzles are fun promotional items that can be printed with your brand logo and your organization initials. These slider puzzles make affordable and memorable promotional item that will be used by your customers over and over again. If you are looking for impressive promotional giveaways for kids, these promotional puzzles are the best. They offer great relief from conventional promotional relief and they serve as great stress busters, too. Keep your young audience entertained and inspired with these custom printed slider puzzles from Promo4kids.com. Your shopping at Promo4kids.com entitles you to a free online design proof, free artwork assistance, 100% customer satisfaction guarantee and 110% lowest price match guarantee. Fast production times and fast shipping facilities in USA keeps us much ahead of most other competitors in the niche. We do understand that kids need a break from hectic daily schedules and deadlines. They need games that offer them relaxation, distraction and help them to build on their skills. From custom printed slider puzzles to coin puzzles to customized cube puzzles, Promo4kids.com stocks variety of games and toys that will reflect your company's brand image and deliver a relaxing break to kids. If you are feeling that puzzles are just fun and nothing else, you are wrong. Puzzles are fun and help kids to build their problem solving skills. This is the one reason why customized puzzles are perfect choice for your next promotional event. Do you know solving puzzles helps to improve mental acuity and helps to relieve stress and stimulate brain functions? The ability to join together pieces of a puzzle taps on both sides of the brain and help to sharpen your memory and improve brain functions. Keeping brain benefits aside, the best thing about these customized puzzles is that kids can carry them in their school bags or pockets and play with it anywhere. Slider puzzles can be played at the study table, at home or can be carried in pockets during picnics or outings with parents. Do you know a thing about giving puzzles to kids? They have a tendency to share their favorite entertaining toys with other kids. In short, your brand logo will fast reach hands of your potential customers and hit their consciousness, too. Show your potential customers that your company works hard to amuse them and keep them entertained with these custom printed slider puzzles. 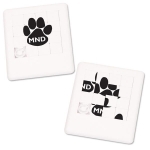 You can give logo slider puzzles during tradeshows, school spirit events, business conventions and other mass events. Puzzles make great entertaining gifts for events such as anniversary celebrations, wedding favors, birthdays and other joyous occasions. All our promotional puzzles can be printed with your brand logo and they make a gift that is both unforgettable and distinctive. Imprinted slider puzzles will amuse adults as they do kids. So you shouldn’t waste time thinking twice about investing in these customized puzzles. Order today and seek advantage of attractive wholesale price benefits! You can call us at our toll-free number at 855-454-3786 to know more details or write to us at info@promo4kids.com.